A pioneer in full-home sound systems, Sonos aims to provide the highest-quality home audio products. The Santa Barbara, California-based company’s laser focus on the customer experience is why it adopted a social support strategy with an inSided community at its center. Sonos wanted its community to be the primary point of contact for customers in need of support. Less than two years after partnering with inSided, the Sonos community serves more than 1 million users per year. The community now handles 40% of Sonos’ support interactions, helping save the company millions of dollars annually. In addition, community members have posted 1,100 product configuration conversations, helping Sonos build trust among prospective customers. Sonos’ separate beta community allows users to suggest product ideas - and vote on each other’s suggestions. The beta community’s 13,000 members have created more than 300 ideas for Sonos. During its 15 years of existence, Sonos has made customer experience a priority. That focus on quality is why the company partnered with inSided. 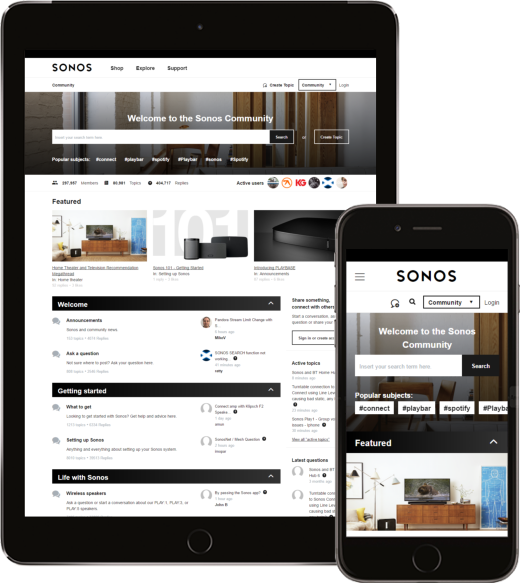 By providing user-friendly, highly functional community management tools, inSided helps Sonos deliver compelling digital experiences to customers and prospects. The community is our next bet for the future, so when a customer starts with care, he’ll start on the community.